I birded 10-14 Aug. 2017 with visiting U.S. birder Bob Orenstein. We noted 107 species at coastal sites in Shanghai and southeastern Jiangsu. 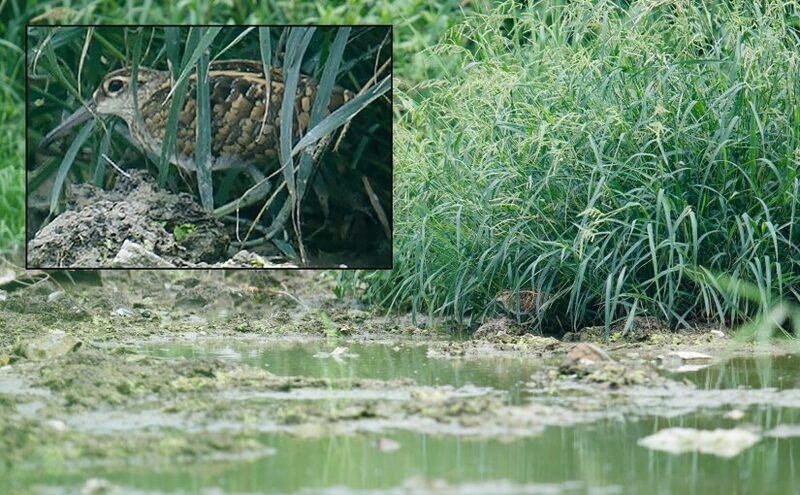 At Pudong’s Cape Nanhui on 13 Aug., Bob and I had a rare Shanghai record of Greater Painted-snipe (above) and an early record of Mandarin Duck. On 12 Aug. at Dongling (32.224520, 121.534355), an impressive site that I had never birded, we had critically endangered Spoon-billed Sandpiper and 2605 endangered Great Knot. We saw 4 Nordmann’s Greenshank at Dongling and had 30 members of that endangered species 11 Aug. at the coastal birding area (32.757056, 120.952294) at Dongtai. We noted Himalayan Swiftlet at Dongling as well as on 10 Aug. at Cape Nanhui, where we also had Amur Paradise Flycatcher. Dongling is only 185 km north of People’s Square in Shanghai, closer than the declining old hot spot of Yangkou (“Rudong”) and the Dongtai coastal areas. Through a steady rain 12 Aug., Bob and I found high-tide roosts containing seas of Great Knot plus a single lonely Spoon-billed Sandpiper in complete winter plumage. Seeing so many Great Knot was extremely heartening. In stark contrast, however, was endangered Far Eastern Curlew, of which only 5 were noted. Unlike near-threatened Eurasian Curlew (130), which though not abundant at Dongling numbered in the thousands at coastal Dongtai, Far Eastern Curlew were abundant nowhere. On 11 Aug. Bob and I birded the reclaimed area of eastern Hengsha Island. The place was a bustle of activity, even at 5:15 in the morning, with 18-wheelers and dump trucks rumbling by. Security was tight. Guards were stationed at every intersection and in roving vans, one of which stopped us. We told them our purpose was birding; they told us to leave. Before getting kicked out, Bob and I enjoyed one of my best moments ever with near-threatened Reed Parrotbill. 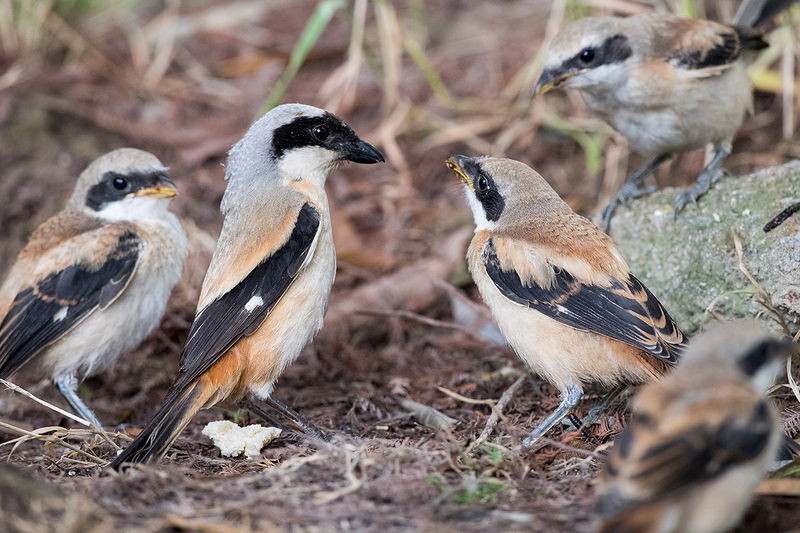 A mega-flock of about 50 birds, much larger than the flocks one sees in the smaller, and ever-shrinking, reedy areas at Cape Nanhui, was making a loud noise during a morning feed. The flock contained juveniles and adults and proved that, provided it has habitat in which to flourish, Reed Parrotbill is a common, even dominant, reed-bed specialist. Let’s look more closely at some of our birds. Greater Painted-snipe Rostratula benghalensis. 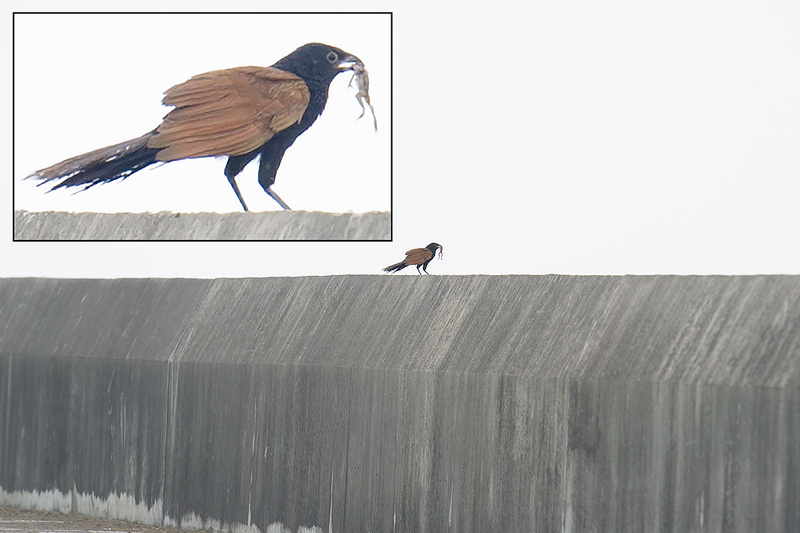 We found the birds in a canal at Cape Nanhui, where they likely are breeding. 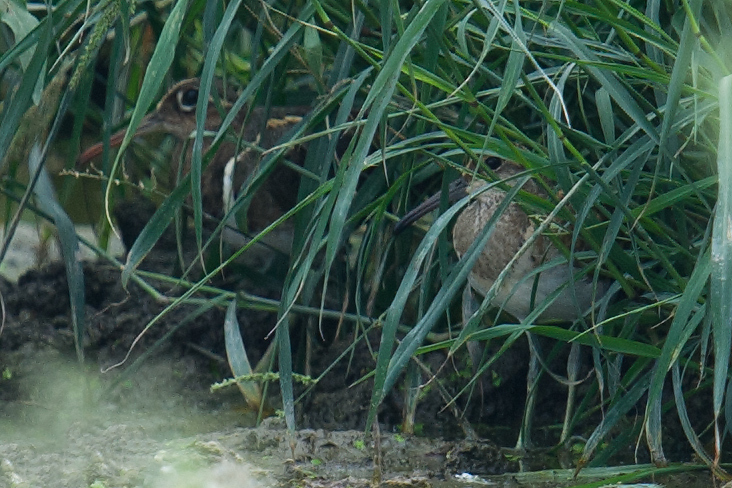 ​With the help of local Chinese birders, Bob and I found a pair of Greater Painted-snipe in a thickly vegetated, trash-strewn canal. 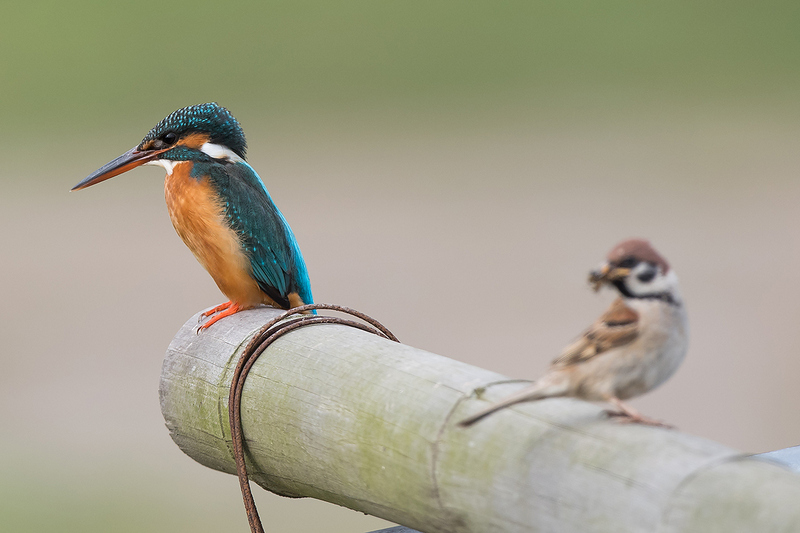 The shy birds were aware of our presence and nervous, but they held their ground. 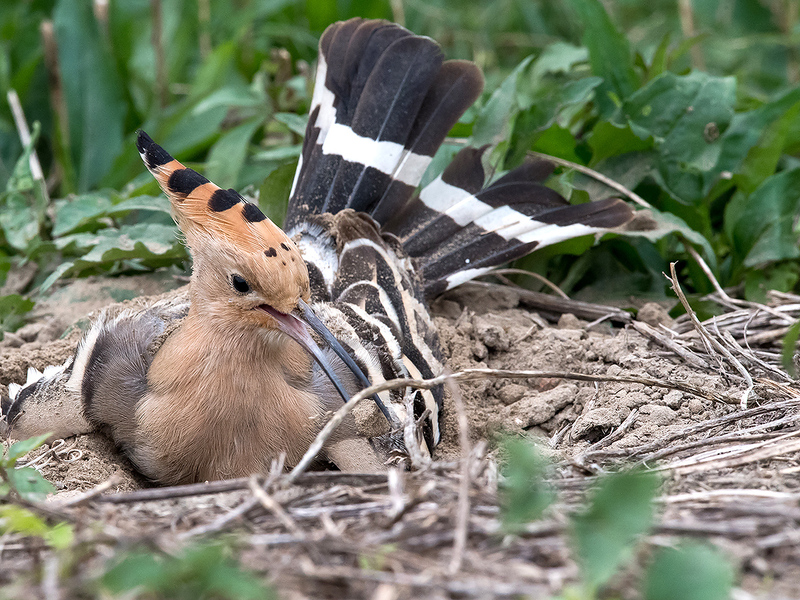 That behavior, in combination with a photo another Chinese birder took suggesting that the male is brooding, persuaded us that the pair has a nest. We moved quickly away and did not return. Footage I got 11 Aug. at Dongtai figures prominently in this video I made comparing Nordmann’s Greenshank to Common Greenshank. 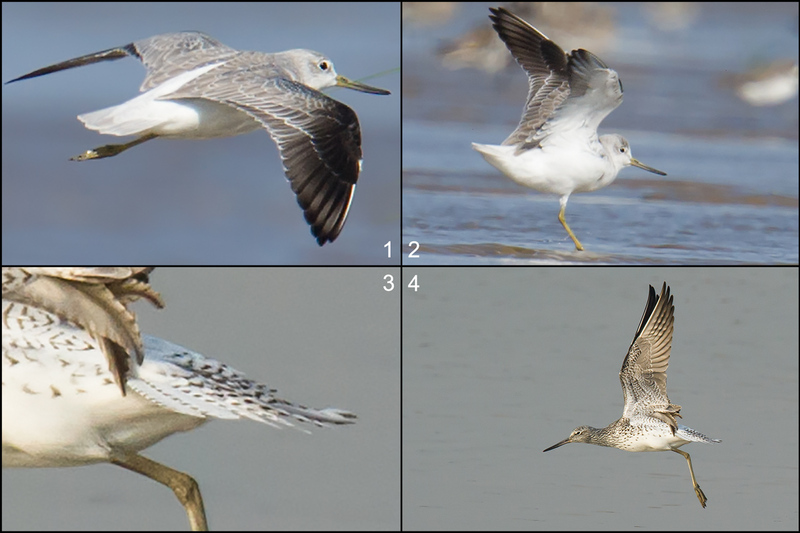 To further hone your Nordmann’s Greenshank ID skills, and to relive the exciting appearance in 2016 of Nordmann’s Greenshank in Shanghai, see my post, Your Handy-Dandy Nordmann’s Greenshank ID Primer! 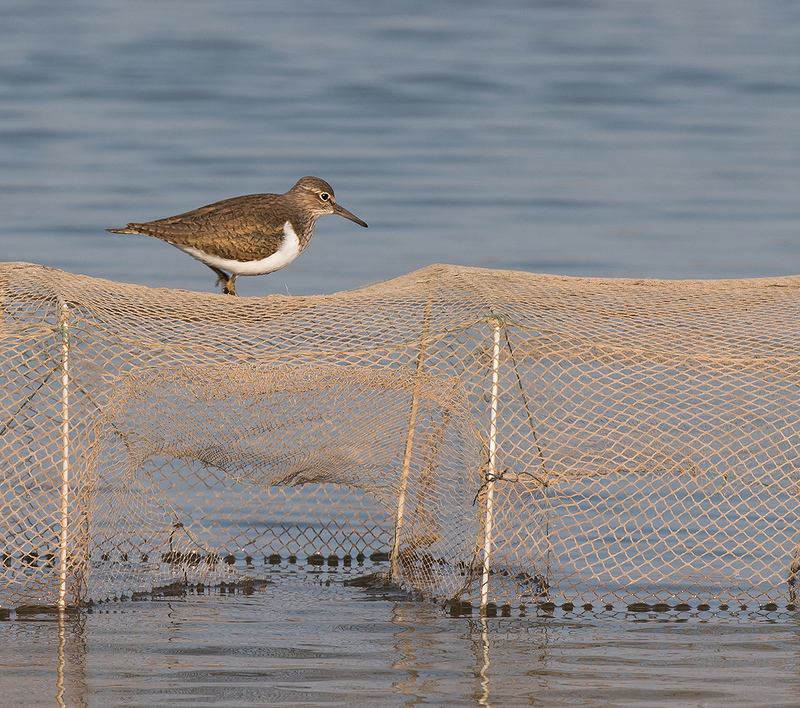 Great Knot was the star of this four-wader movie I made at Dongling. The video below records one of my closest encounters ever with “Swintail” Snipe. I found this individual 14 Aug. at the sod farm (31.103100, 121.829300) south of Pudong International Airport. As the autumn migration season progresses, the sod farm bears checking; on 3 Sept. 2016 at the farm, my partners and I had a rare Shanghai record of Common Ringed Plover. It was an exciting moment 10 Aug. when Amur Paradise Flycatcher appeared in Microforest 1 (30.923889, 121.971635). In the photo above, note the indistinct border between the bluish hood and white belly and the two-tone coloration of the hood–darker blue head, lighter blue breast. In Japanese Paradise Flycatcher, the hood tends to be uniformly colored and the border between the hood and white breast more distinct. Let us say I assigned these silent cuckoos to Common Cuckoo Cuculus canorus. 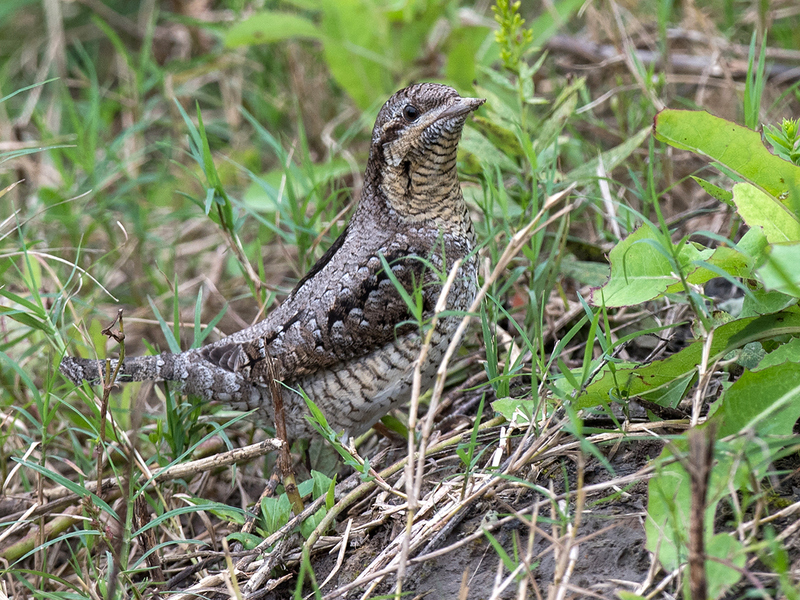 Perhaps they were the size of a sparrowhawk (ruling out thrush-sized Lesser Cuckoo C. poliocephalus), and perhaps they even had yellow irides (ruling out dark-eyed Indian Cuckoo C. micropterus and providing yet more evidence against dark-eyed Lesser Cuckoo). Even if my cuckoos passed these tests, unless they were singing the classic song (virtually unheard this time of year), how could I justify ID-ing them as Common? It is, of course, likely that some of them are Common, but how can one be sure that any given silent Cuculus cuckoo one is seeing is Common? I refrain from making speculative species assignments. I refrain because we still do not know enough about the migration patterns in Shanghai of Oriental Cuckoo C. optatus and Himalayan Cuckoo C. saturatus. Like so many of the woodland passerines that pass through Shanghai on migration, Oriental Cuckoo breeds in northeastern China. Like those woodland passerines, Oriental Cuckoo also may pass through Shanghai on migration. Oriental, of course, is very similar to Common, the two species having so many overlapping characters that a firm ID of non-photographed, non-singing birds is all but impossible; and Himalayan, which theoretically may be present in or near our region, is even more similar to Oriental (“virtually identical”—Mark Brazil, Birds of East Asia, p. 256). 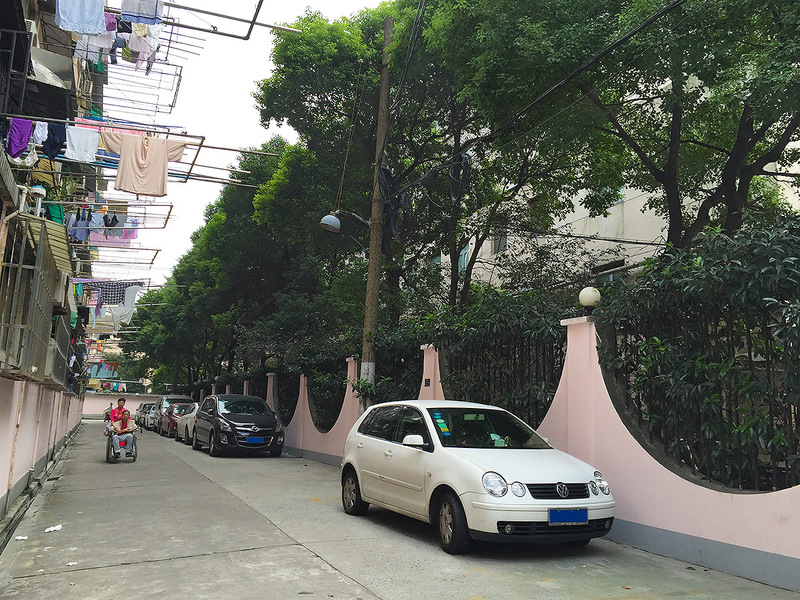 In Shanghai it may be tempting to assign silent Cuculus cuckoos, particularly yellow-eyed adults, to Common Cuckoo. Before I ever started doing that, though, I would want to know more about Oriental Cuckoo and Himalayan Cuckoo in the Shanghai region. Maybe future studies, using captured cuckoos whose DNA has been analyzed, will reveal a surprising pattern of Cuculus migration in Shanghai. Maybe those studies will show that considerable numbers of Cuculus passage migrants are Oriental Cuckoo. Until that day comes, I usually hold back from ID-ing non-singing Cuculus cuckoos. 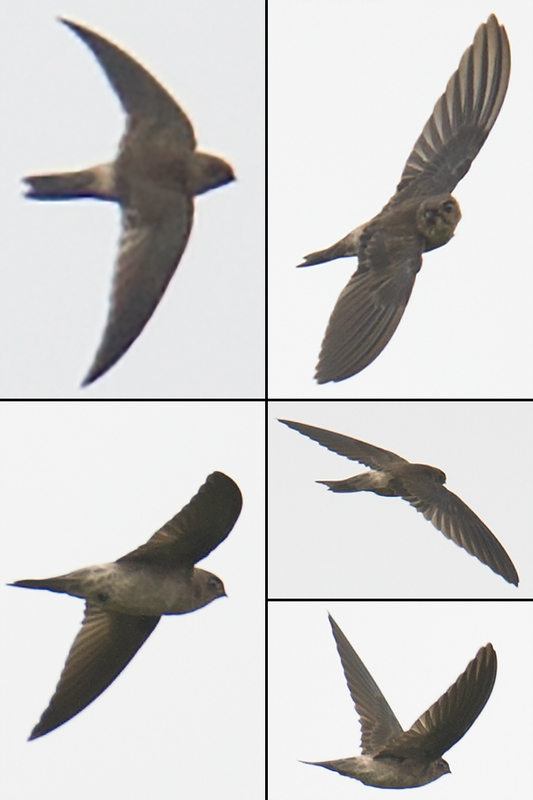 ​After being nearly unheard of in Shanghai as recently as a few years ago, Himalayan Swiftlet is now more and more regularly recorded in Shanghai in both spring and autumn. The question arises of whether Himalayan Swiftlet has always been a scarce passage migrant and overlooked or whether its numbers are increasing in our area. 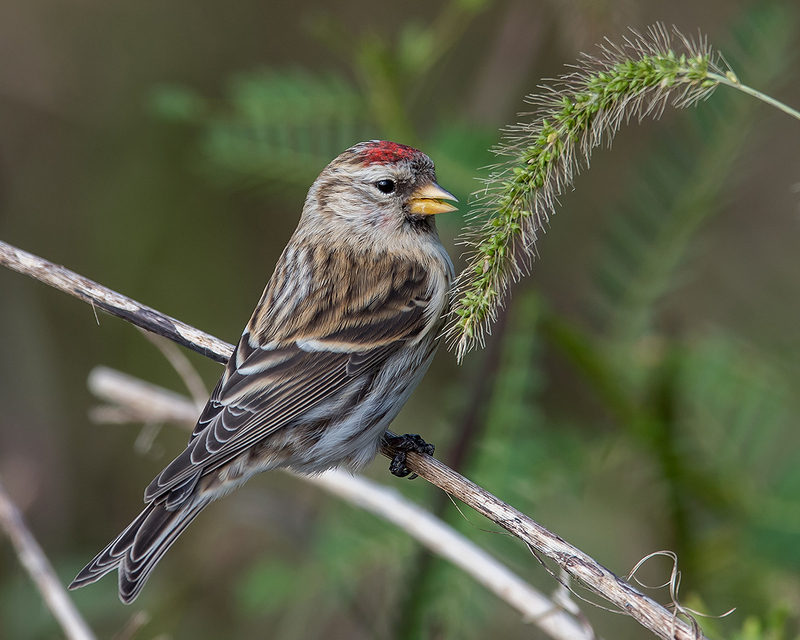 It is of course also possible that both its numbers are increasing in our area and local birders’ skills and communication methods are improving. That communication methods are improving is indisputable. 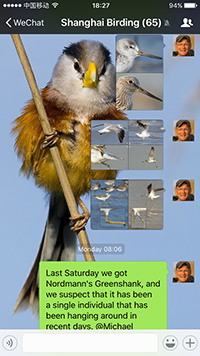 One of the main causes of the improved communication is the WeChat group I founded, Shanghai Birding. 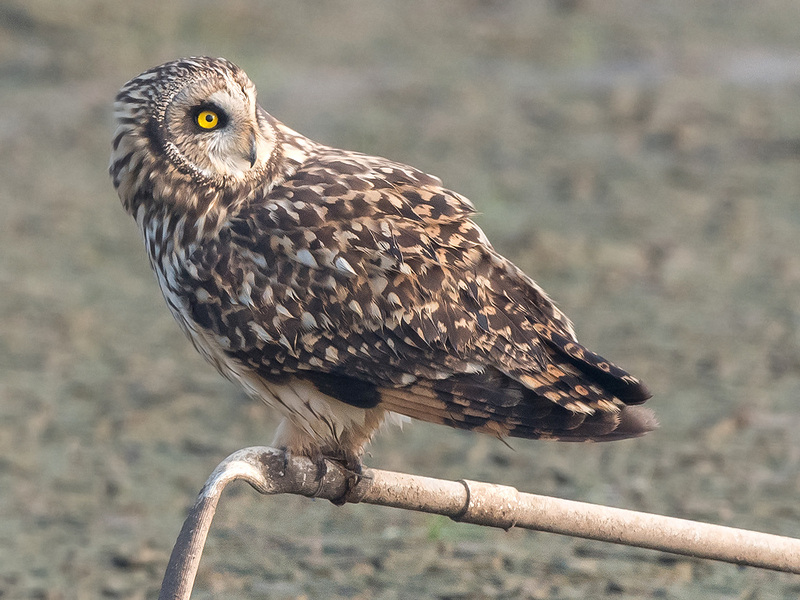 The members of that group, who range from the newest of newbies to some of the most expert birders in China, regularly exchange sightings in real-time. To join Shanghai Birding, friend me on WeChat (WeChat ID: craigbrelsford). 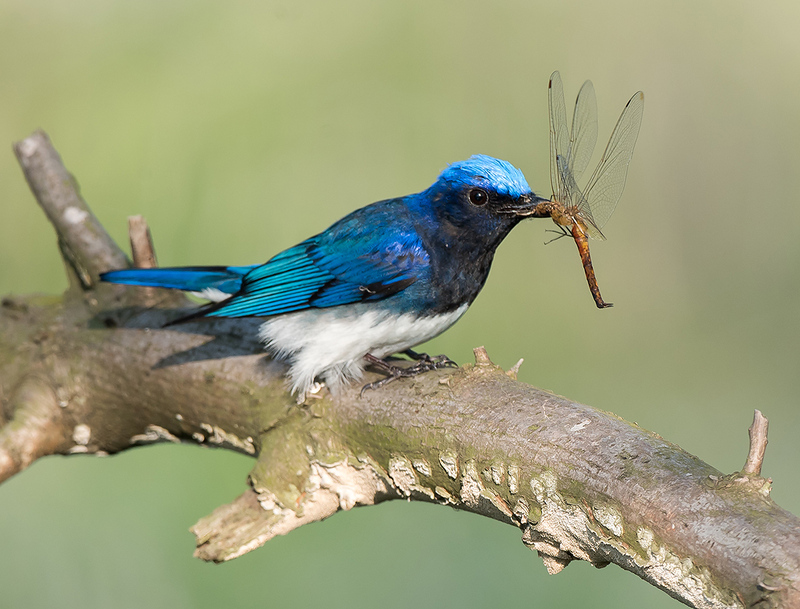 Tell me that you wish to join Shanghai Birding. I’ll add you. 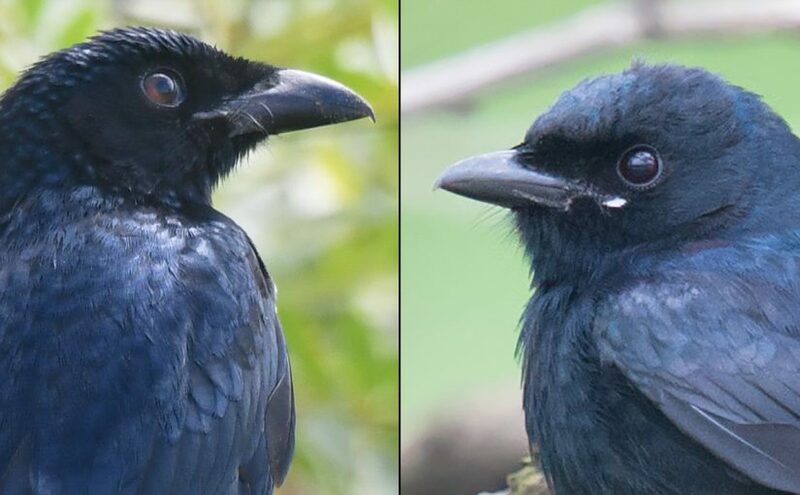 Editor’s note: The image above shows Crow-billed Drongo (left) and Black Drongo. The former was noted in Shanghai on Tues. 11 Oct. 2016, a first for the city. The latter is a common passage migrant in Shanghai. In this post, I show you how to separate the two species. On Tues. 11 Oct. 2016 at Nanhui, Shanghai’s major birding spot on the East China Sea, Shanghai Birding member kaca found a first-winter Crow-billed Drongo Dicrurus annectans. kaca’s record was the first for Crow-billed Drongo in Shanghai. Crow-billed Drongo Dicrurus annectans, Nanhui, 11 Oct. 2016. First record for Shanghai. Photos © 2016 by kaca. Used with permission—and gratitude. — All drongos have a strong, black bill. Crow-billed (Panel 2a, above) may have the stoutest, as deep at its base as it is wide. — The iris in kaca’s first-winter Crow-billed is reddish-brown (2a). Adult Crow-billed has a blood-red iris. Compare brown iris of adult Black at top of post. 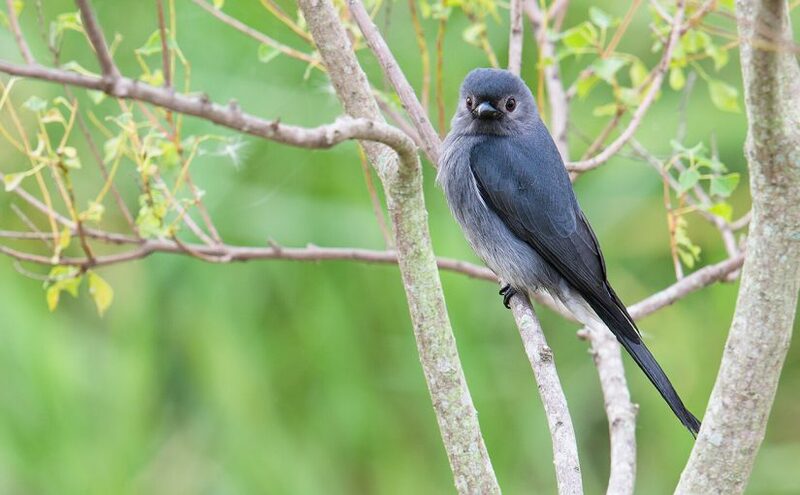 — Black Drongo often shows white spot at gape, never present in Crow-billed. Note again the photo leading off this post. — First-winter Crow-billed shows white spotting from breast to undertail coverts (2b, 3). First-winter Black, by contrast, shows more patchily white underparts (panels 1a, 1b in photo below). — The tail of Crow-billed shows a less shallow fork than the tail of Black. On average, the tail of Black is forked about twice as deeply as that of Crow-billed. Compare Panel 4 in photo above to Panel 2 in photo below. 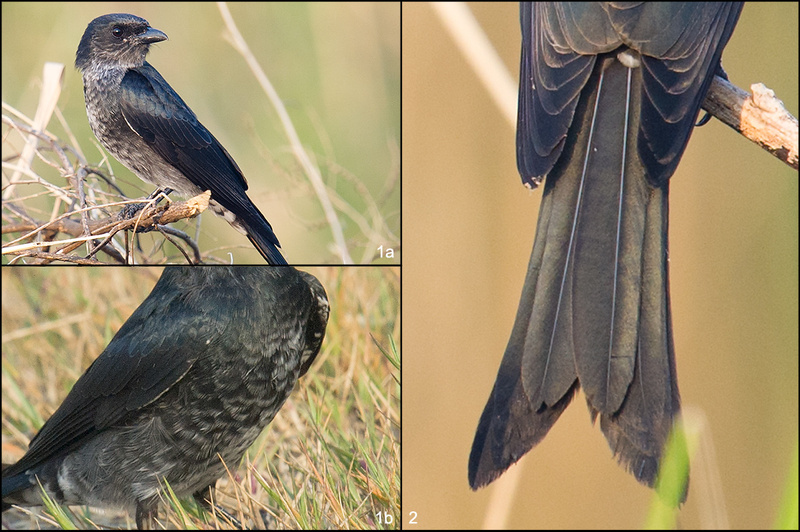 Adult Crow-billed and Black have deeper forks, but the proportions are the same as in the sub-adults. In addition, the outer rectrices of Crow-billed’s tail are more likely to curl upward. A monotypic species, Crow-billed Drongo Dicrurus annectans breeds from the Himalayan foothills in India east to Hainan. In winter some birds go as far south as Sumatra and Java. 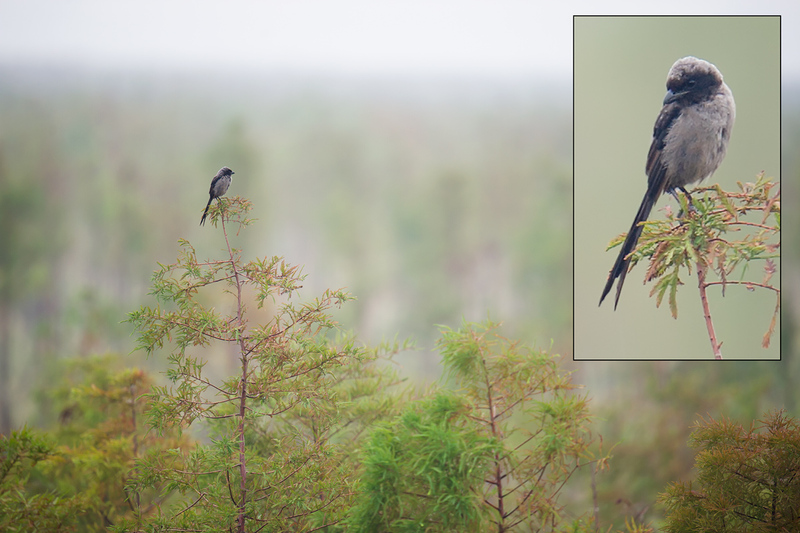 Shenzhen-based French birder Jonathan Martinez, an expert on southeast China birds, reports breeding populations of Crow-billed in northern Guangdong and southwest Hunan. There are coastal records, most likely of migrants, from Hong Kong and Guangxi. Shanghai Birding member Paul Holt writes that Crow-billed is “undoubtedly overlooked” in southern China and “is probably quite rare or at least very localized.” Martinez agrees, calling Crow-billed “scarce” even at the Guangdong and Hunan sites. On Tuesday I arrived in Nanhui too late to see Crow-billed Drongo. My partners Kai Pflug and Elaine Du and I made the fateful decision to cover Hengsha Island in the morning. The alluvial island at the mouth of the Yangtze was decidedly humdrum, with Far Eastern Curlew out on the mud along with 2 Sanderling and a Ruddy Turnstone. The huge new tree plantation on the island failed to deliver any forest birds beyond a single Asian Brown Flycatcher. There was a good count (17) of Richard’s Pipit. We arrived in Nanhui and found kaca, who mentioned an unusual drongo he had seen that morning. We kept our eyes peeled for dark drongos, finding none. Our Nanhui harvest was limited to expected October birds such as Grey-backed Thrush (6) and Eyebrowed Thrush (2). Asian Brown Flycatcher (26) seemed to be on every tree. 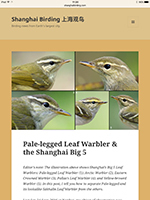 All of Shanghai’s Big 5 Leaf Warblers were present: Pallas’s Leaf Warbler (1), Yellow-browed Warbler (1), Arctic-type Warbler (2), Pale-legged/Sakhalin Leaf Warbler (7), and Eastern Crowned Warbler (2). We had 3 Japanese Paradise Flycatcher, Elaine’s and my season’s first Daurian Redstart, Asian Stubtail, and Rufous-tailed Robin. I’m trying to get over missing the Crow-billed Drongo. I tell myself, “That’s birding,” but those words can’t fully dispel the empty feeling. I am however happy for kaca, and I am encouraged, because the growing fluidity in reporting is leading to ever more astounding new bird records for Shanghai. Birds noted on Hengsha Island (Héngshā Dǎo [横沙岛]), a small alluvial island at mouth of Yangtze River in Shanghai, China. S gate to reclaimed area at 31.297333, 121.859434. Partly cloudy. Low 17° C, high 19° C. Humidity 64%. Visibility: large buildings visible from distance of 38 km. Wind NE 18 km/h. PM2.5 AQI: 42 (good). Sunrise 05:55, sunset 17:25. TUE 11 OCT 2016 07:15-10:15. Craig Brelsford, Elaine Du, & Kai Pflug. Birds noted around Pudong Nanhui Dongtan Wetland (Pǔdōng Nánhuì Dōngtān Shīdì [浦东南汇东滩湿地]; 30.920507, 121.973159), Pudong, Shanghai, China. Partly cloudy. Low 17° C, high 19° C. Humidity 64%. Visibility: large buildings visible from distance of 38 km. Wind NE 18 km/h. PM2.5 AQI: 42 (good). Sunrise 05:55, sunset 17:25. TUE 11 OCT 2016 13:00-18:05. Craig Brelsford, Elaine Du, & Kai Pflug. Screen shot from Shanghai Birding. Brelsford, Craig, moderator. Shanghai Birding, a WeChat chat group. Quotations in post from Paul Holt and Jonathan Martinez taken from this chat group. 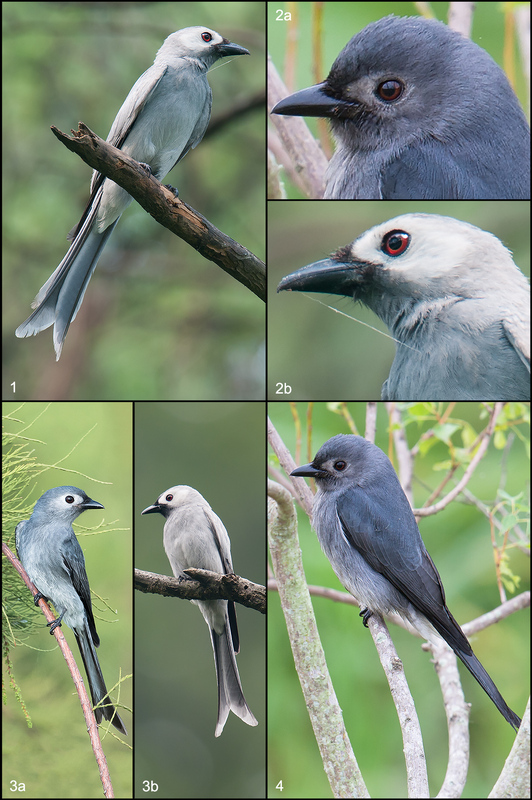 News about kaca’s discovery of Crow-billed Drongo was first disseminated in this chat group. del Hoyo, Josep, et al., eds. The Handbook of the Birds of the World. Lynx Edicions. Vol. 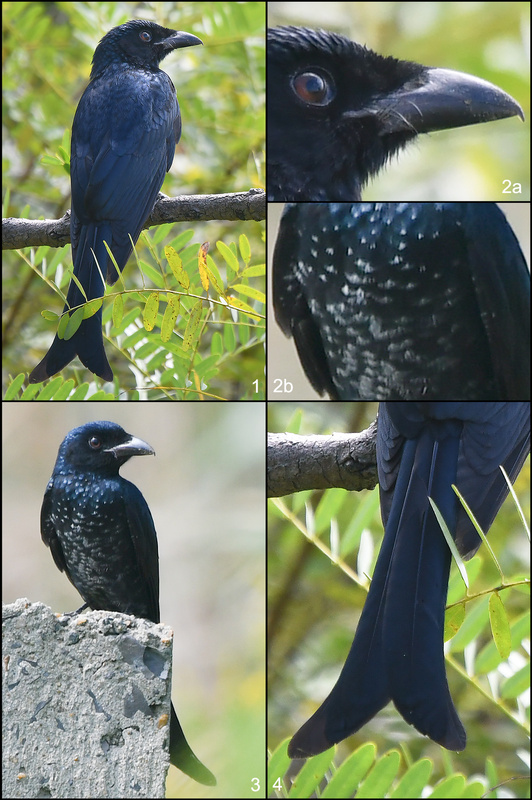 14, “Bush-shrikes to Old World Sparrows.” Highly detailed species accounts for Crow-billed Drongo (p. 212) and Black Drongo (p. 222) written by G.J. Rocamora and D. Yeatman-Berthelot. MacKinnon, John & Karen Phillipps. A Field Guide to the Birds of China. Oxford University Press. Entry on Crow-billed Drongo, p. 282. Message, Stephen & Don Taylor. 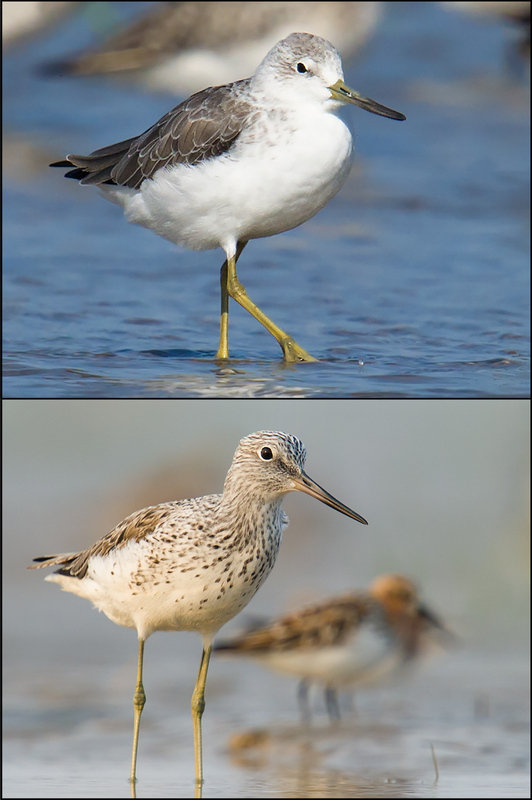 Waders of Europe, Asia and North America. 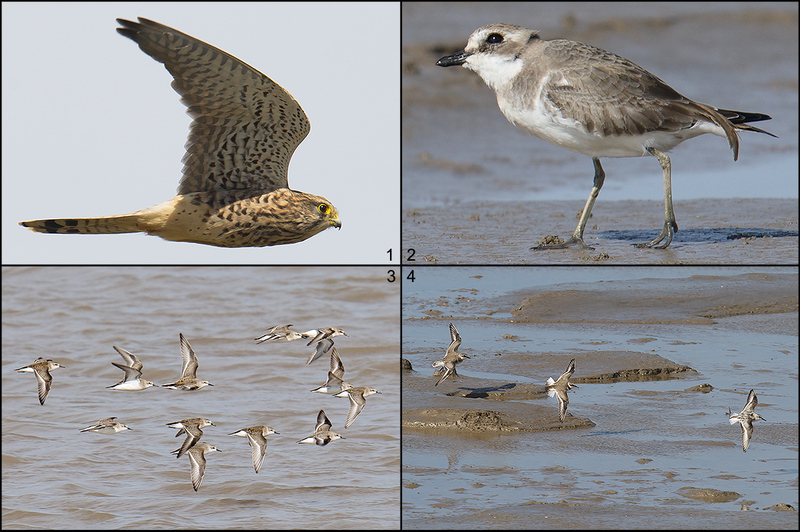 Refreshed my memory on basic points separating Lesser Sand Plover from Greater Sand Plover. Robson, Craig. Birds of Southeast Asia. Princeton University Press. Crow-billed Drongo and Black Drongo, p. 176. 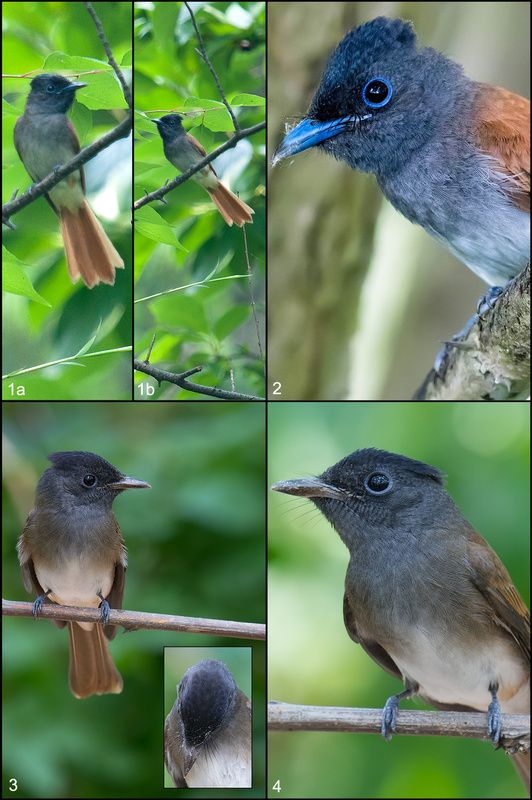 Editor’s note: The featured image above shows the stunning male Japanese Paradise Flycatcher and serves to introduce this week’s theme: How can birders tell apart the two species of the remarkable genus Terpsiphone that migrate through Shanghai? 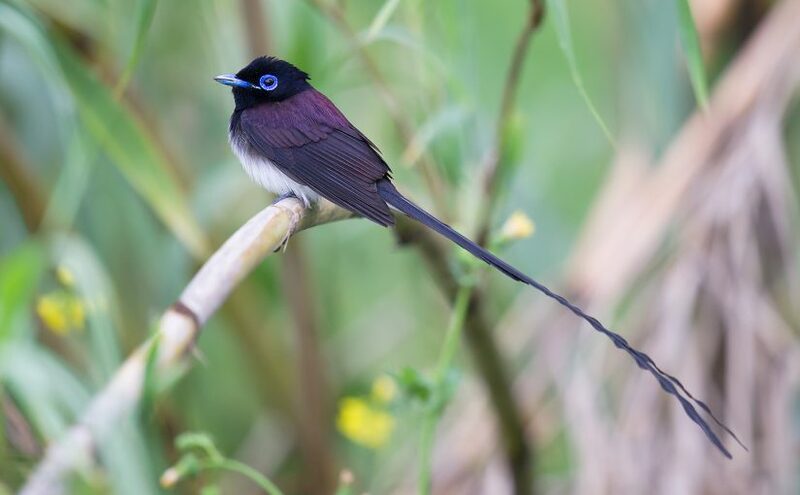 — If in Shanghai you see a white-morph paradise flycatcher, then by definition you are not looking at Japanese Paradise Flycatcher, and you are almost certainly looking at Amur Paradise Flycatcher. 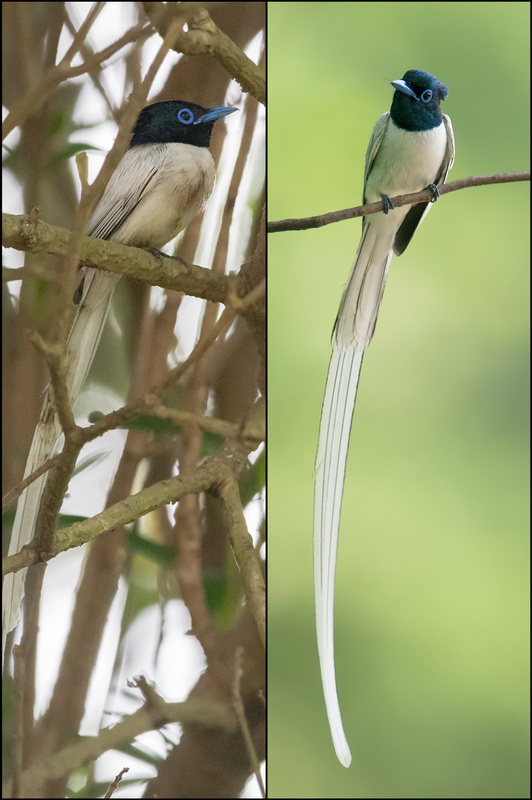 Two images of Amur Paradise Flycatcher Terpsiphone incei, white morph. L: Nanhui, Shanghai, 30 May 2016 (Kai Pflug). R: Dongzhai National Nature Reserve, Henan, 5 June 2010 (Craig Brelsford). 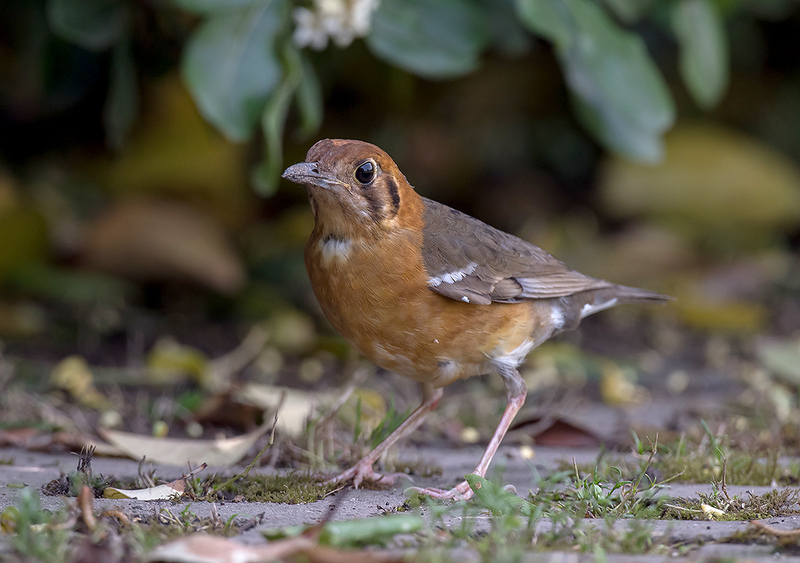 Most Amur males are rufous, but a certain percentage are white. Japanese Paradise Flycatcher T. atrocaudata has no white morph. No white morph exists in Japanese (Mark Brazil, Birds of East Asia). Regarding Amur, among my sources only Brazil expresses doubt about the existence of a white morph. shanghaibirding.com contributor John MacKinnon (A Field Guide to the Birds of China) and C.W. Moeliker (Handbook of the Birds of the World, Vol. 11) assure us that Amur white morph does exist. MacKinnon says that Amur white morph accounts for less than half of adult males. We know that Amur white morph exists because we have seen it ourselves. On 30 May 2016, Kai Pflug photographed an Amur white morph at Nanhui, the coastal birding site in Shanghai. In May 2010 at Dongzhai, Henan, 680 km inland from Shanghai, I found an Amur white morph. Could a white morph from a third species occur in Shanghai? 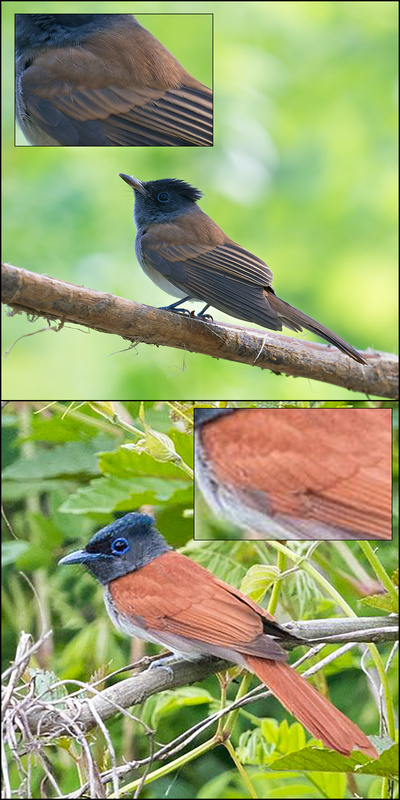 Although the movements of paradise flycatchers are “complex and not fully understood” (Moeliker), I think we can presume that it is unlikely. 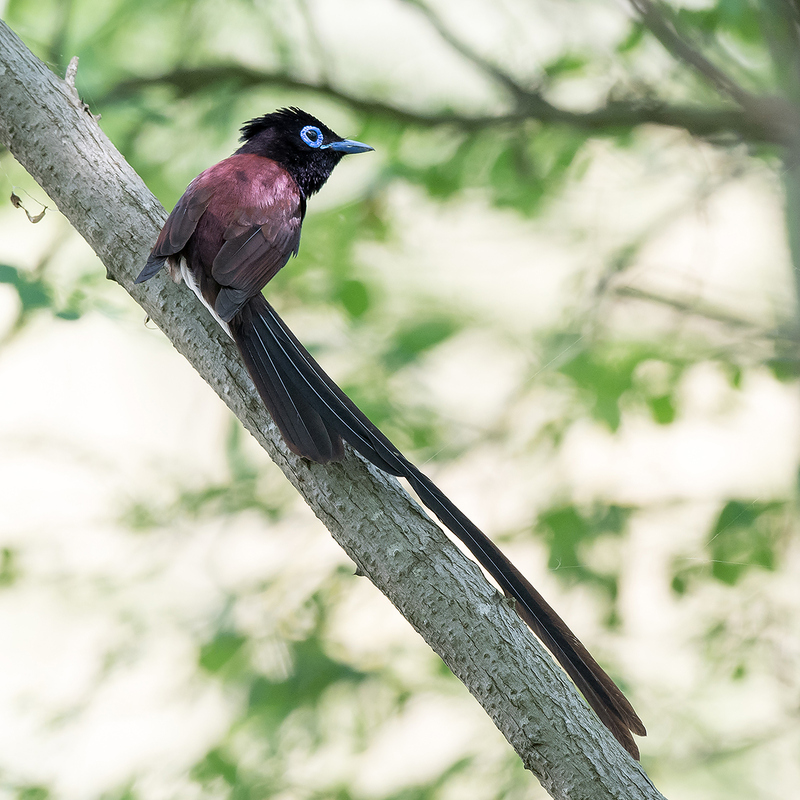 The nearest third species is Oriental Paradise Flycatcher T. affinis saturatior, which according to MacKinnon winters no closer to Shanghai than Guangdong. — The mantle, wings, rump, and tail of rufous-morph male Amur are rufous-brown; in Japanese, the mantle, wings, and rump are purplish-brown, and the tail is black. In Amur male (top), the mantle, wings, rump and tail are rufous-brown. 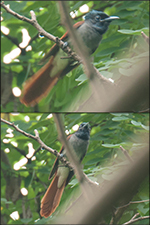 Japanese male has purplish-brown mantle, wings, and rump and a contrasting black tail. Amur: Nanhui, June 2016 (Kai Pflug). Japanese: Yangkou, Jiangsu, 2 May 2012 (Craig Brelsford). The pictures speak for themselves. In good light you should have little trouble telling the two apart. The cinnamon tones of Amur are often what Shanghai birders notice first. — Male Japanese has a black head and a black breast, forming a large hood. Amur rufous morph has black head and grey breast, forming a two-tone hood. In Japanese (top two photos), the black head and throat seamlessly meet the black breast, forming an oversized hood. 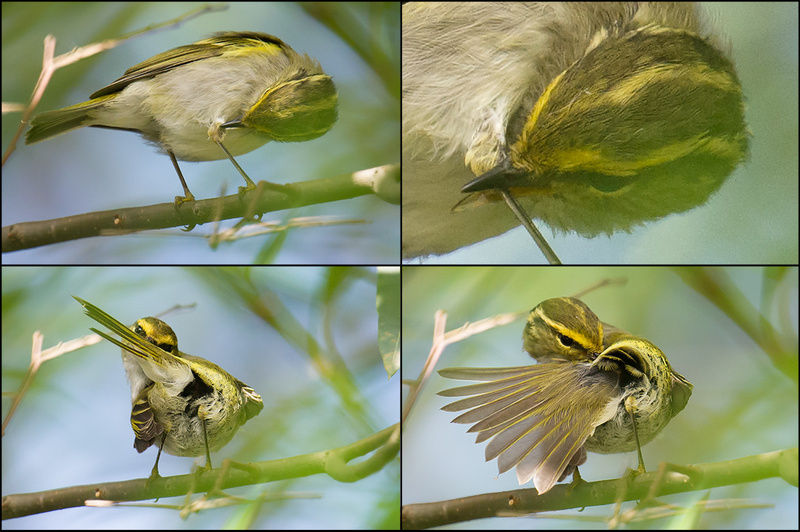 (Note however some grey feathers in the worn spring Japanese male top left.) 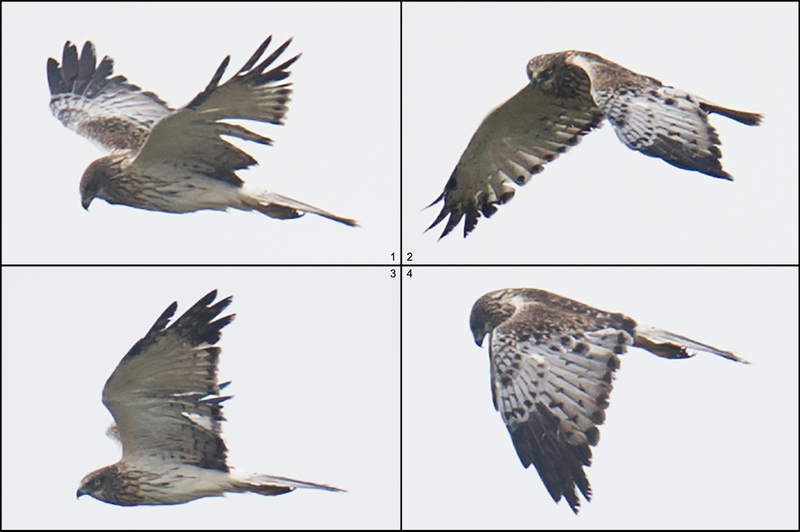 By comparison, the black head of Amur (bottom photos) contrasts with its grey breast. 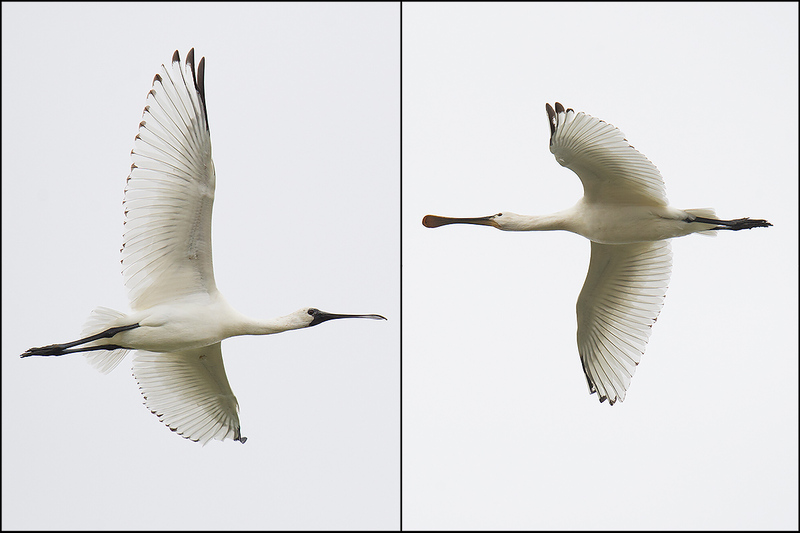 Japanese: Yangkou, 2 May 2012 (top left) and Nanhui, 17 Sept. 2016 (top right); both by Craig Brelsford. Amur: both Nanhui, June 2016 (Kai Pflug). The hood of Amur has in addition more of a bluish tint than that of Japanese. Note the blue tint in the hood of Amur bottom left. Note also that the cobalt-blue eye ring of Japanese (top left) tends to be larger than the eye ring of Amur. — Compared to Amur female, Japanese female has darker, duller, and less rufous mantle, wings, rump, and tail. Japanese has much darker (nearly all-black) flight feathers and sooty primary coverts. 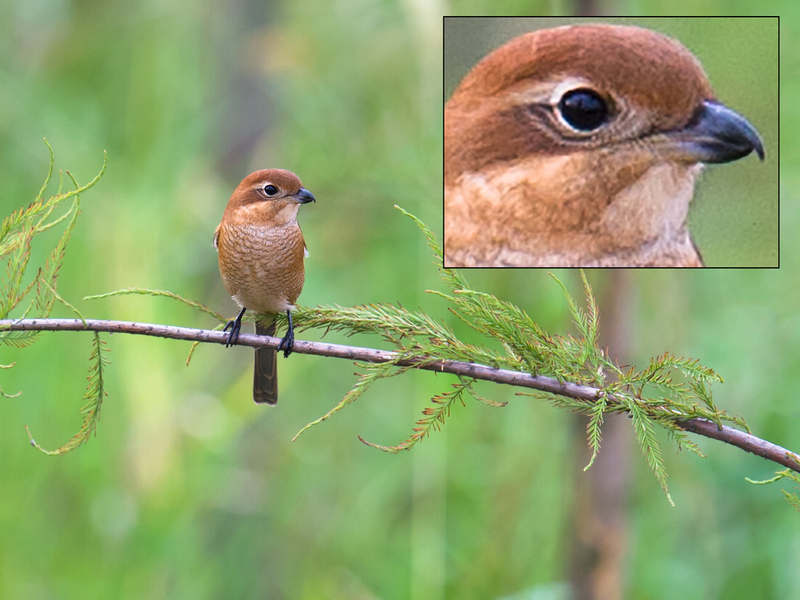 As with the males, female Japanese (top) is darker and less rufous than female Amur (bottom). Japanese: Yangkou, 30 Sept. 2013 (Craig Brelsford). Amur: Nanhui, May 2016 (Kai Pflug). 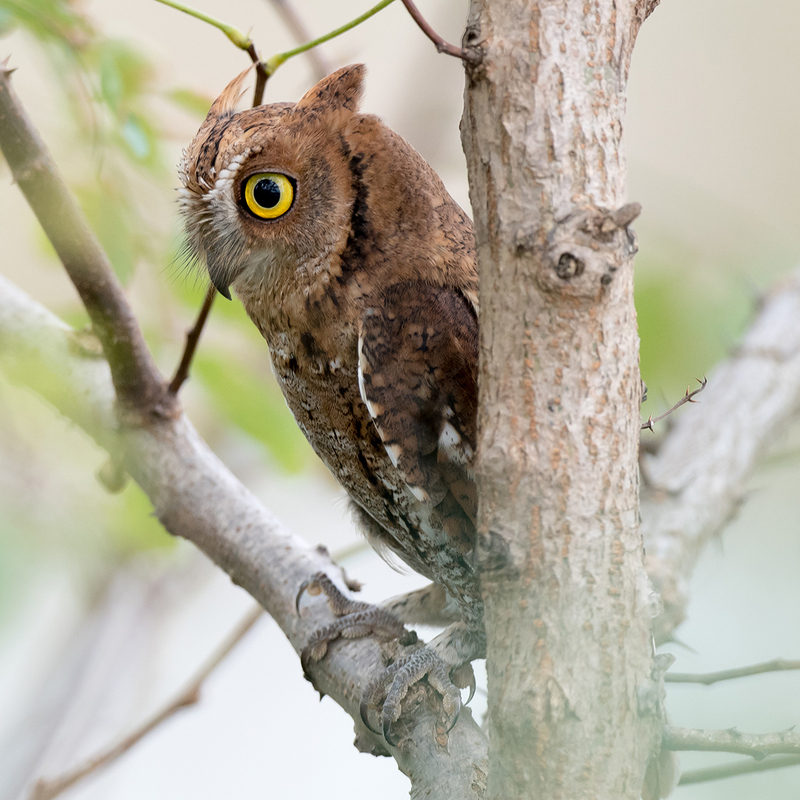 For the bit about the sooty primary coverts, I am indebted to David Gandy of Bangkok City Birding. — In their head and breast coloring, female Japanese and Amur show a pattern similar to that of the males. 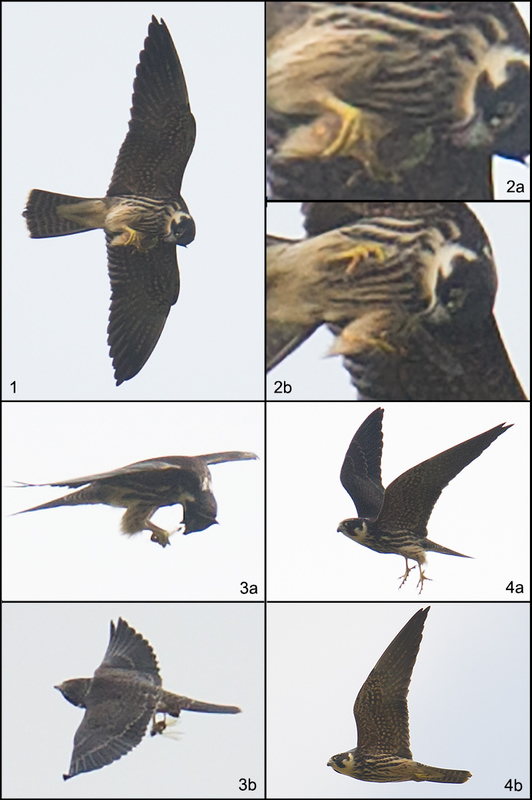 Whereas Japanese is more concolorous (panels 3 and 4), Amur shows more of a contrast between head and breast (1a, 1b, 2). Both Japanese and Amur female have whitish bellies, but the darker breast of Japanese contrasts more with the whitish belly than is the case with Amur. The head is glossier in Amur than in Japanese, whose crown is dull (inset, Panel 3). Japanese has faint rufous flanks, unlike Amur. 1a, 1b: Amur Paradise Flycatcher, Dongzhai, Henan, 5 June 2010 (Craig Brelsford). This female is the mate of the Amur white-morph shown above. 2: Amur, Nanhui, May 2016 (Kai Pflug). 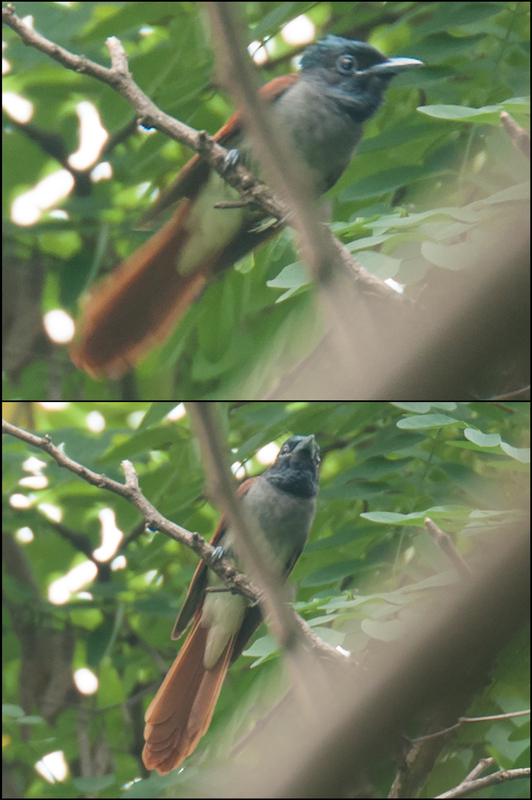 3, 4 and inset on 3: Japanese Paradise Flycatcher, Yangkou, Jiangsu, 30 Sept. 2013 (Craig Brelsford). Japanese Paradise Flycatcher Terpsiphone atrocaudata and Amur Paradise Flycatcher T. incei breed farther north than any other species in their mainly tropical genus. T. atrocaudata atrocaudata breeds in Korea, Japan, and Taiwan and is highly migratory, wintering as far south as Sumatra. 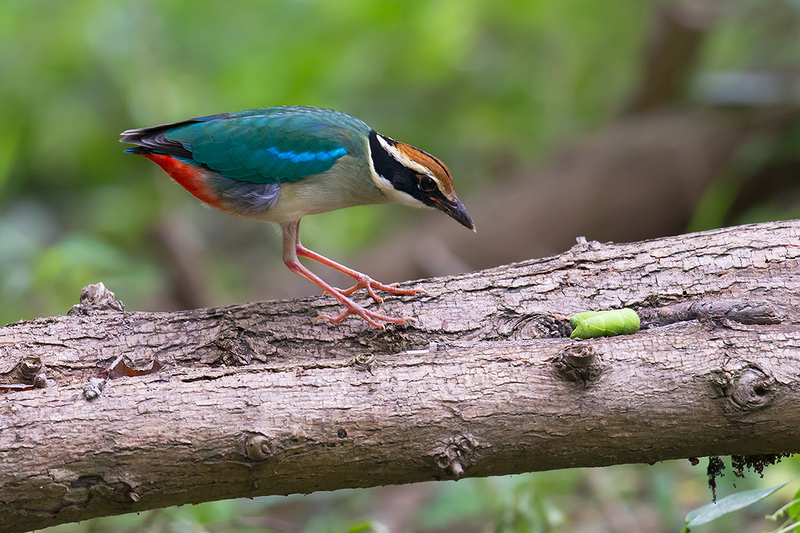 (Birds in Taiwan, however, are largely resident.) T. incei, a monotypic species, is also highly migratory, with a breeding range extending into the Russian Far East and wintering grounds as far south as Java (Moeliker). Japanese is listed by the IUCN as Near Threatened, mainly because of habitat loss on its wintering grounds. While researching drongos, on 18 Oct. 2016 I discovered two more photos of female Amur Paradise Flycatcher. The photos above were taken 4 July 2009 at Laoshan (32.071265, 118.560699), a site in Nanjing, Jiangsu 290 km inland from Shanghai. Note again in this Amur the contrast between bluish-black head and bluish-grey breast, the poorly defined border between the bluish-grey breast and the whitish belly, the lack of rufous coloration on the flanks, and the rufous-brown upperparts and tail, obviously brighter than in Japanese Paradise Flycatcher. Special thanks to Kai Pflug, who collaborated with me on this post, and without whose photos this post would not have been possible. 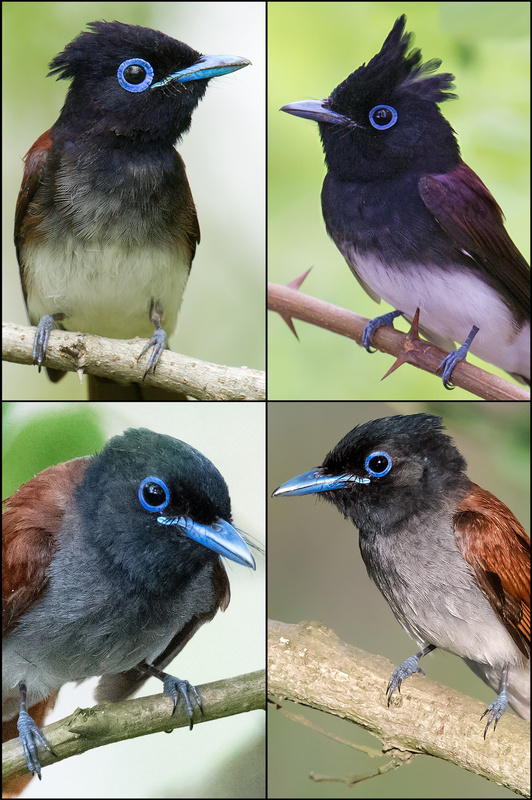 Kai’s images of Amur Paradise Flycatcher, some of which are displayed above, are a valuable record of this poorly known species. 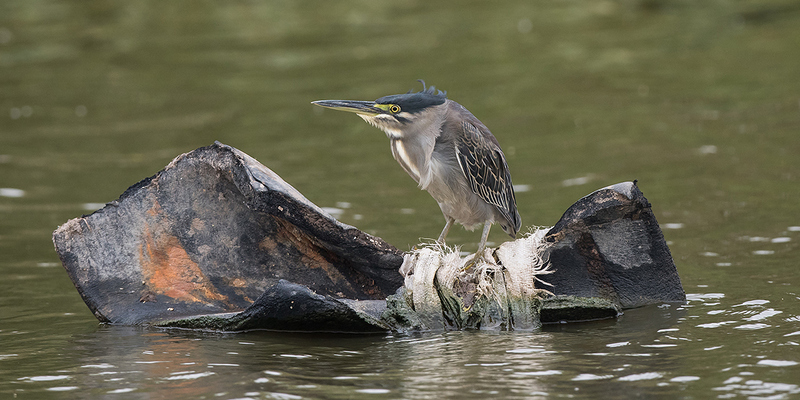 I have published dozens of Kai’s photographs on shanghaibirding.com, and in September 2016 I wrote about his work cleaning up the litter at Nanhui. Kai is from Germany and lives in Shanghai. 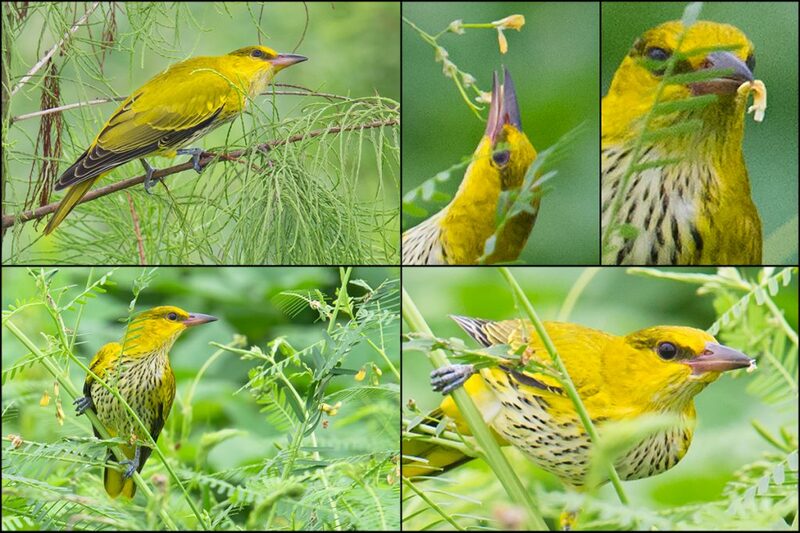 He is an active member of the Shanghai Birding WeChat group. Brazil, Mark. Birds of East Asia. Princeton University Press. 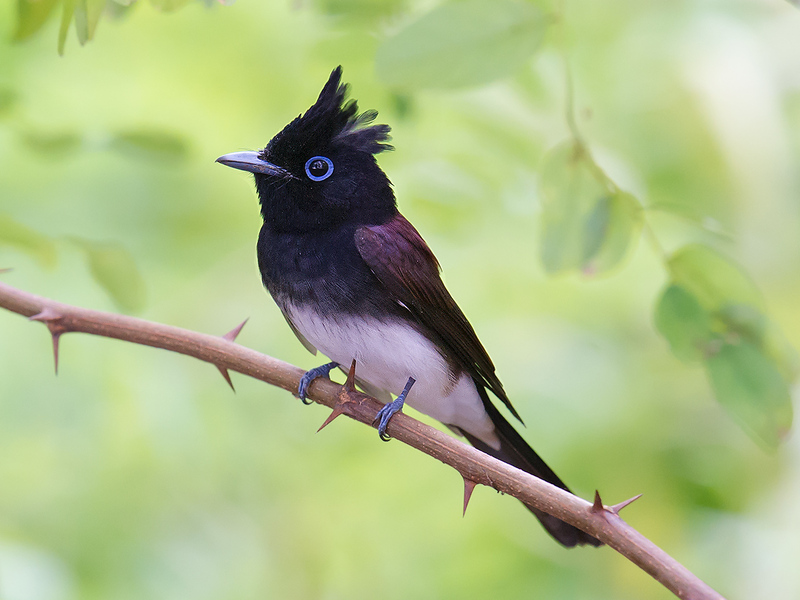 Studied entries on Asian Paradise Flycatcher and Japanese Paradise Flycatcher, p. 302.
del Hoyo, Josep, et al., eds. The Handbook of the Birds of the World. Lynx Edicions. Vol. 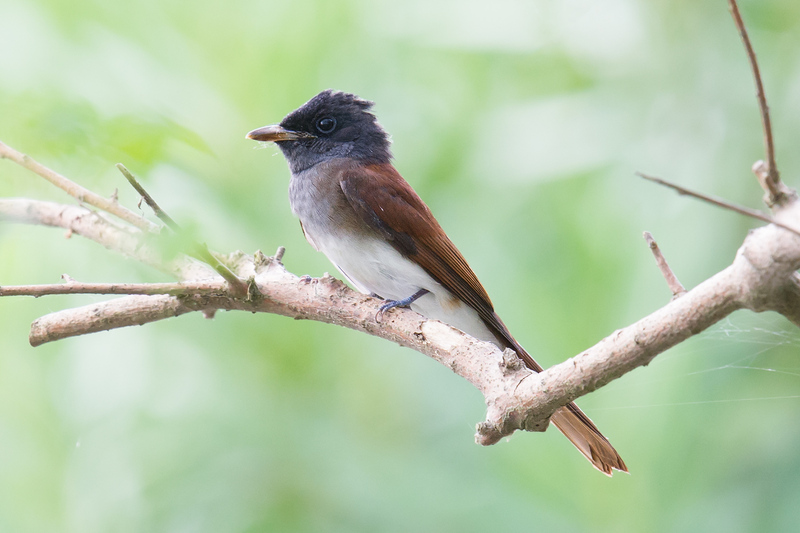 11, “Old World Flycatchers to Old World Warblers.” Species accounts for Asian Paradise Flycatcher (p. 289) and Japanese Paradise Flycatcher (p. 290) written by C.W. Moeliker. Gandy, David. Bangkok City Birding (http://bangkokcitybirding.blogspot.com/). Used article “Hell in Paradise,” published 28 May 2016. MacKinnon, John & Karen Phillipps. 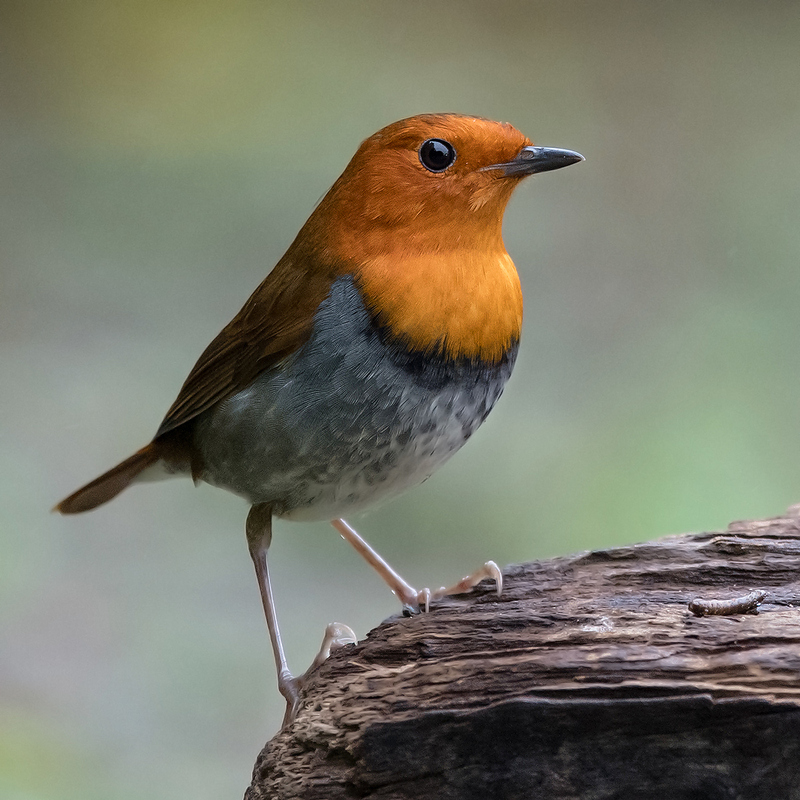 A Field Guide to the Birds of China. Oxford University Press, pp. 284-5. Robson, Craig. Birds of Southeast Asia. Princeton University Press. Helpful insights on Terpsiphone atrocaudata, T. incei, and T. affinis saturatior on p. 180. 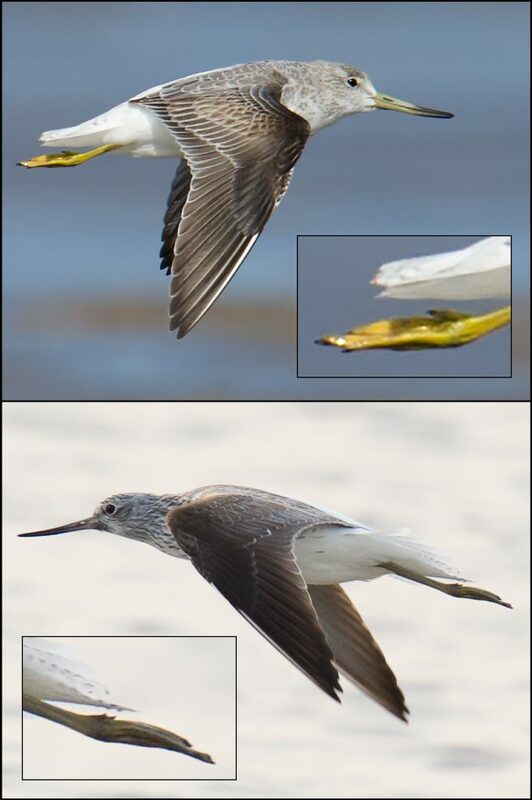 Your Handy-Dandy Nordmann’s Greenshank ID Primer! Distinguishing non-breeding Nordmann’s Greenshank from Common Greenshank is a tricky task, but one that reaps rewards. With practice you too can feel the rush that comes when you realize that the greenshank you are viewing is not one of the most common shorebirds in Eurasia, but one of the rarest. On Sat. 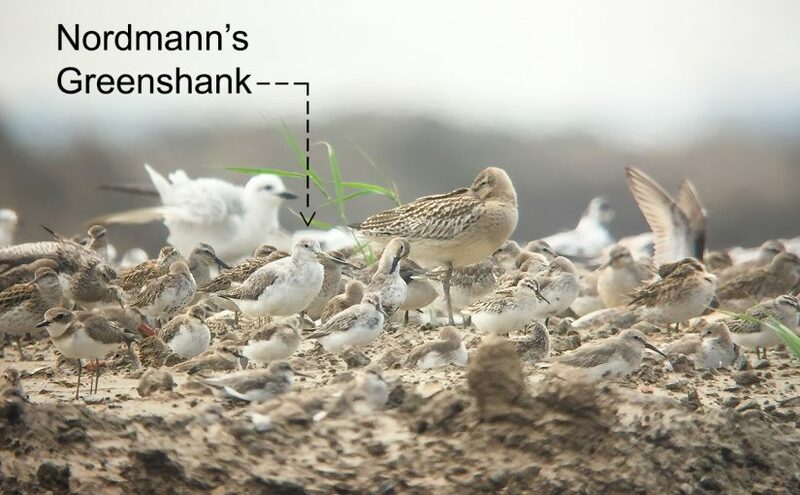 17 Sept. 2016 at Cape Nanhui in Pudong, our team experienced that thrill, picking out a Nordmann’s in a roost holding a few hundred shorebirds. 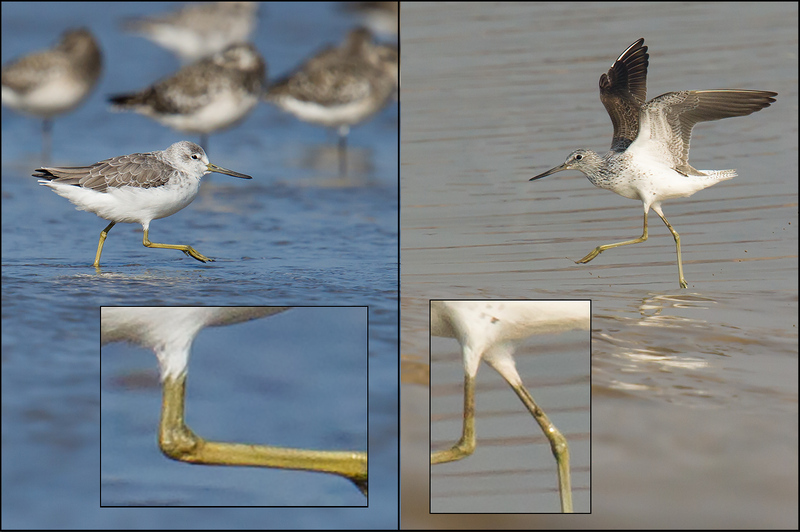 — Tibiae of Nordmann’s Greenshank are noticeably shorter than those of Common Greenshank. The picture above makes it clear. 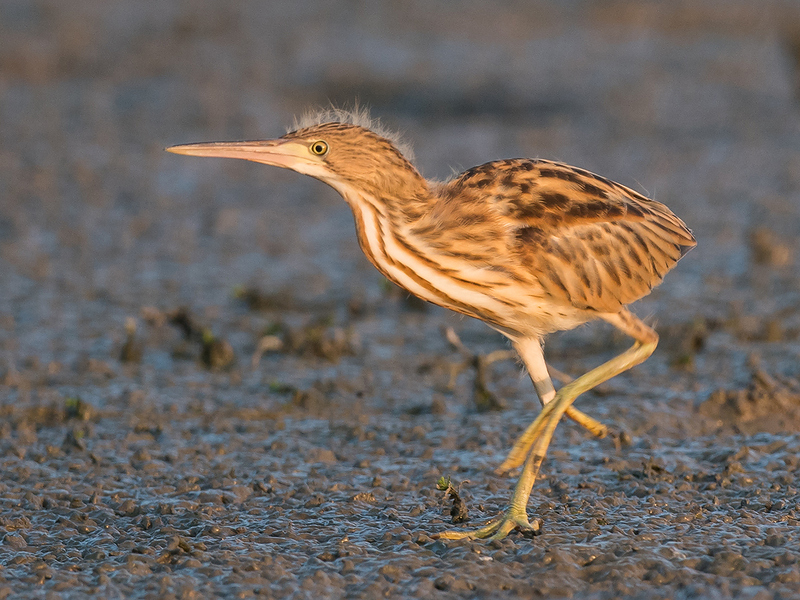 The biggest reason Nordmann’s is known as the stockier bird, the rugby player compared to the ballerina that is Common Greenshank, is tibia and leg length. — Nordmann’s has a thicker neck that it often holds closer to its body and has a pronounced ventral angle (protruding belly), giving Nordmann’s a more hunched appearance than Common. As with many of the characters of these species, the hunched stance of Nordmann’s is not always obvious, especially when the bird is active. Likewise, even a Common sometimes can appear stout. But as one’s observation time grows, the classic features of both species will emerge. — Nordmann’s has a thicker, more obviously bi-colored bill than Common. — The toes of Nordmann’s project just beyond the tail-tip; the toes of Common project farther. This difference can be subtle, and a good camera is sometimes needed to appreciate it. But it is consistent. — Nordmann’s has a cleaner tail and underwing than Common. Even if your Nordmann’s is roosting, you can sometimes note the white underwing. Wait for the bird to stretch out its wing. 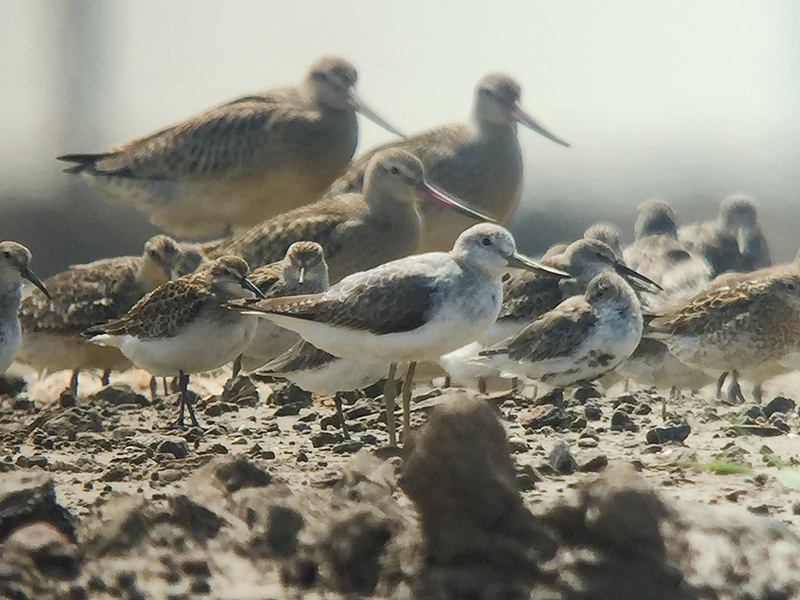 Nordmann’s Greenshank stands among waders at a dry roost at Cape Nanhui, Sat. 17 Sept. 2016. We found the birds at 30.920549, 121.963247. Note the high ‘knee,’ obviously bi-colored bill, and hunched, ‘no-neck’ stance. Photo by Komatsu Yasuhiko using Kowa TSN 883 Prominar spotting scope and Kowa TSN IP6 adapter and Craig Brelsford’s iPhone 6. 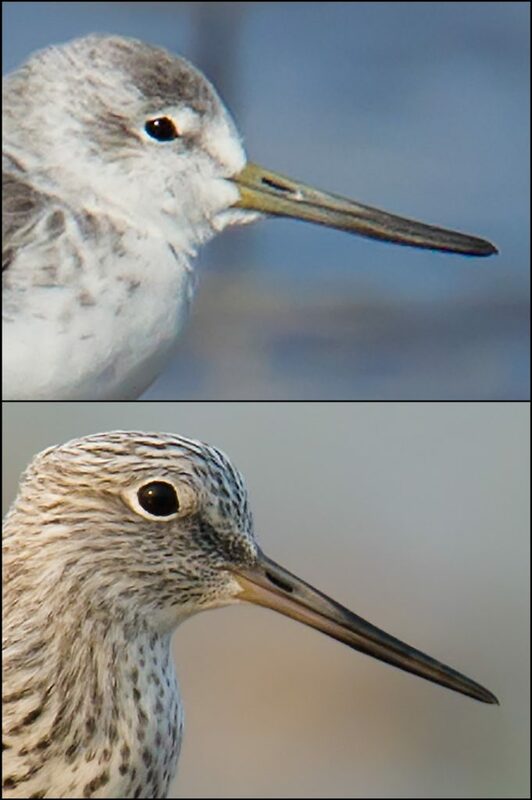 — The calls of Nordmann’s Greenshank and Common Greenshank are markedly different. The well-known “chew-chew-chew” call of Common is never made by Nordmann’s. — In breeding plumage the species are more readily distinguishable. Nordmann’s Greenshank is also known as Spotted Greenshank for good reason. The heavily spotted underparts of breeding Nordmann’s are diagnostic. Unfortunately for birders in Shanghai, however, Nordmann’s in full breeding plumage is rarely seen. Nordmann’s Greenshank Tringa guttifer is an endangered species. Only 500 to 1,000 of these birds are thought to remain. Development along the East Asian coast is the main reason for its decline. Nordmann’s breeds in Russia, passes through China, and winters in Southeast Asia. It is present in the Shanghai area for several months each year. The Nordmann’s took top billing on a day that saw veteran British birder Michael Grunwell, my wife Elaine Du, and me note 71 species at Cape Nanhui, Lesser Yangshan Island, and the sod farm south of Pudong Airport (31.112586, 121.824742). We were joined at the roost and Nanhui microforests by the crack high-school birding team of Larry Chen, Komatsu Yasuhiko, Chi Shu, and Andy Lee. 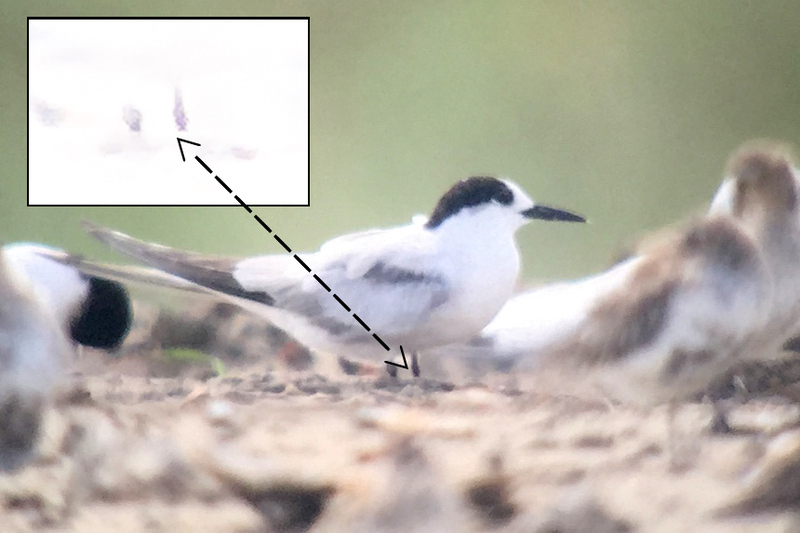 We noted 2500 at Nanhui, by far the highest number of White-winged Tern that I have seen. They made quite a spectacle, fluttering like snowflakes over the reed beds. Three at the roost. Michael and I discussed whether Aleutian Tern, similar to Common Tern in winter plumage, passes through Shanghai and has been overlooked. Check for the red legs of Common; if the legs appear black, then keep investigating; you may have an Aleutian. Ruddy Shelduck is uncommon in Shanghai; I have recorded flocks at Chongming but had never seen the species at Nanhui. We saw a single Ruddy in the marshy agricultural land north of Luchao (芦潮; 30.851111, 121.848528). The godwits, knots, and tattlers were in the dry roost with the Nordmann’s. Every one of these species is at least near-threatened; Great Knot is endangered. After the excitement with the Nordmann’s at the roost, the seven of us covered the microforests. 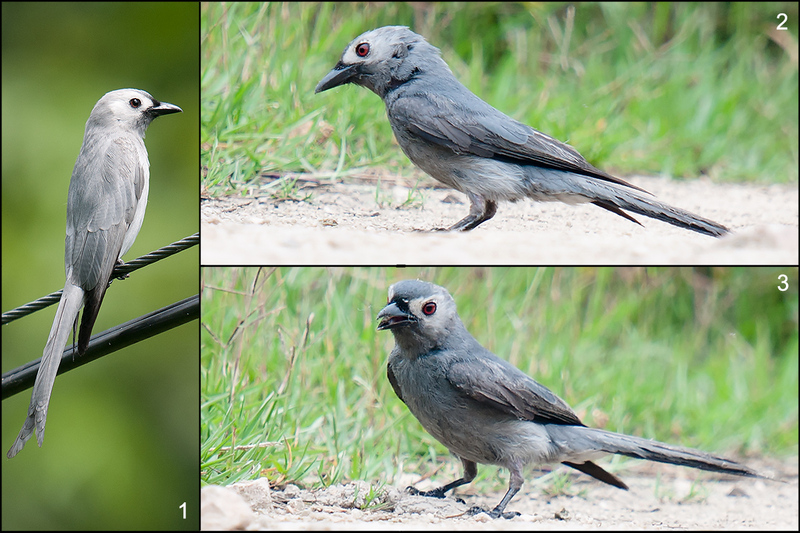 Our teamwork paid off with a view of Black-winged Cuckooshrike, an uncommon passage migrant in Shanghai. Yet another near-threatened species, Terpsiphone atrocaudata is common on migration in Shanghai. We noted 10 on Saturday. 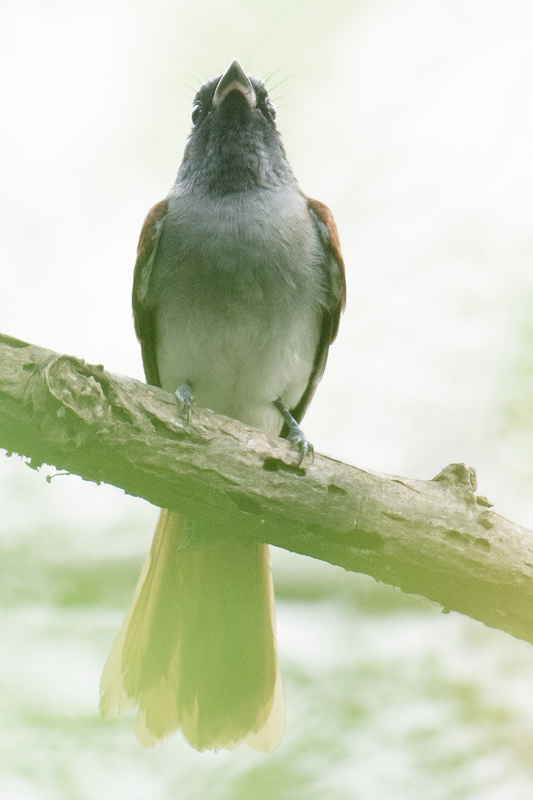 Care must be taken to separate this species from Amur Paradise Flycatcher T. incei, which passes through Shanghai in smaller numbers. Male and female Japanese have a more extensive dark hood, extending almost to the belly, whereas that of Amur extends only to the upper breast. 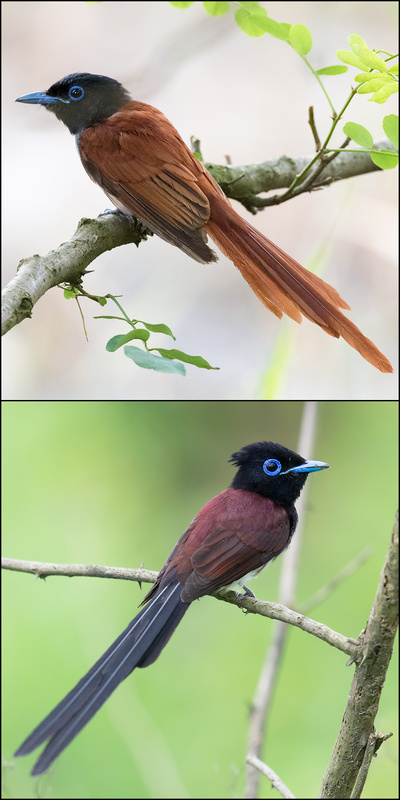 For more help distinguishing these two species, see my post ID Workshop: Paradise Flycatchers. 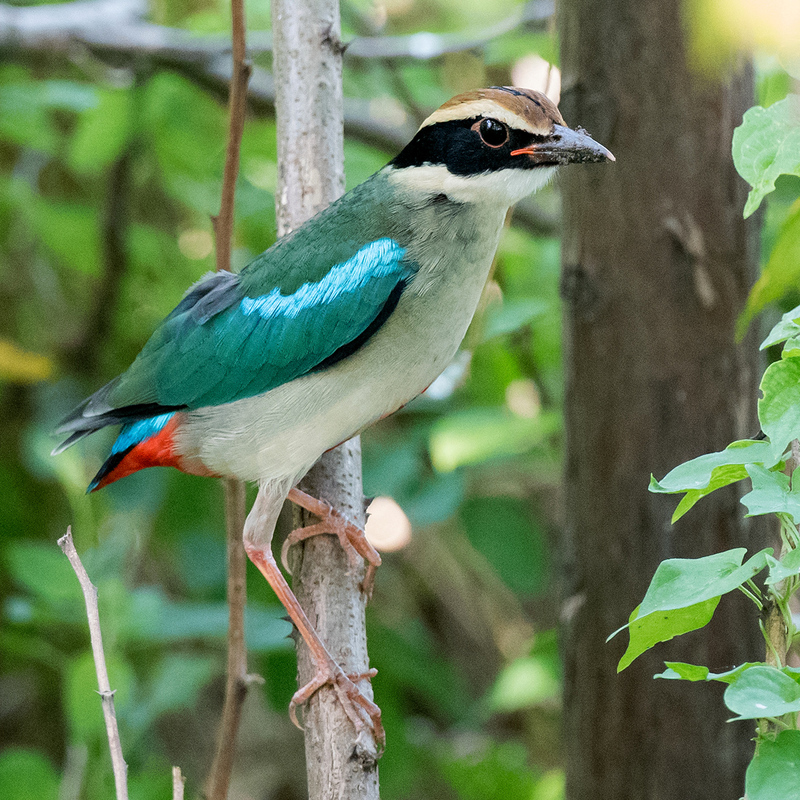 On Lesser Yangshan we found Oriental Dollarbird. Our final stop was the sod farm south of Pudong International Airport, where we found 4 Pacific Golden Plover and 200 Oriental Pratincole. Featured image: Nordmann’s Greenshank stands among wader roost at Cape Nanhui, 17 Sept. 2016. Using the principles described in this post, our team was able to ID this Nordmann’s. Photo by Komatsu Yasuhiko (“Hiko”) using his Kowa TSN 883 Prominar spotting scope and Kowa TSN IP6 adapter and Craig Brelsford’s iPhone 6. Posted on September 18, 2016 March 25, 2019 Author Craig BrelsfordTags Amur Paradise Flycatcher, birding in China, Elaine Du, Japanese Paradise Flycatcher, Komatsu Yasuhiko, Michael Grunwell, Nanhui, Nordmann's Greenshank, Shanghai birding, Spotted Greenshank, Tringa guttifer3 Comments on Your Handy-Dandy Nordmann’s Greenshank ID Primer! Let’s hear it for Kai Pflug! 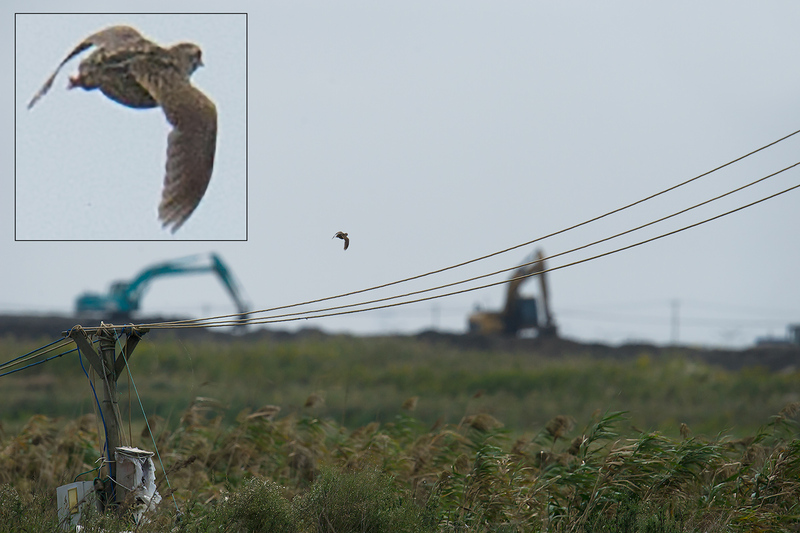 The Shanghai-based German birder has taken it upon himself to clean up Cape Nanhui, Shanghai’s best-known birding area. On Sun. 11 Sept. 2016, Kai hauled out two bagfuls of trash from Nanhui’s Microforest 2 (30.926138, 121.970795), and I’m proud to say my wife Elaine Du helped Kai out on Microforest 1. 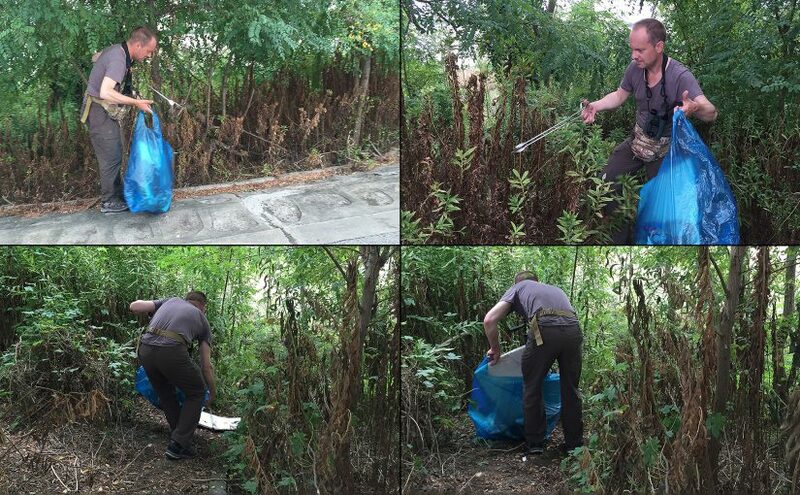 Kai has long been cleaning the microforests, and his work has had a big effect on those precious migrant traps. In his car, Kai keeps six pairs of tongs as well as a roll of plastic bags. Kai told me he uses tongs “to show others that it’s possible to clean up trash without getting your hands dirty!” He keeps six pairs so that others can join him in his quest to keep the microforests clean. Kai’s actions Sunday were the backdrop to an eventful birding day. Partnering yet again with veteran British birder Michael Grunwell, Elaine and I noted 75 species. 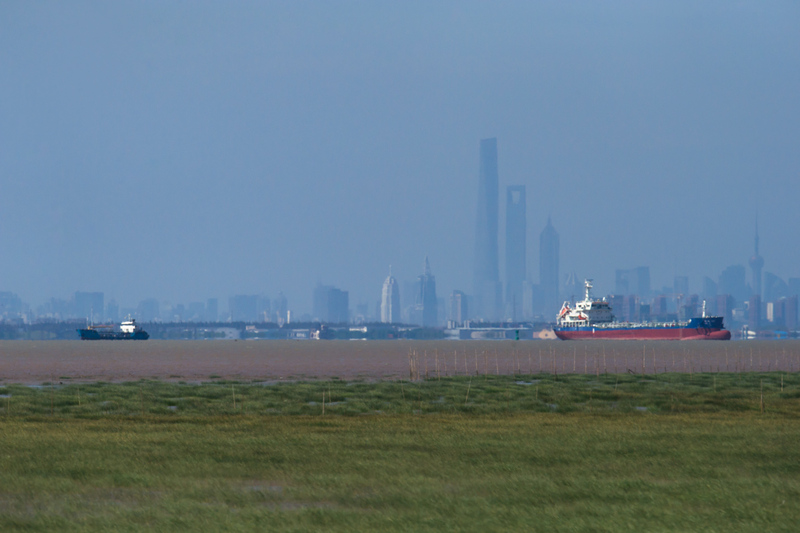 We birded the well-known coastal sites at Nanhui as well as the sod farm south of Pudong Airport. We had our first migrant bunting of the season, endangered Yellow-breasted Bunting; Himalayan Swiftlet in the skies above the Magic Parking Lot (30.882784, 121.972782); and Pechora Pipit in the wet agricultural land north of Lúcháo (芦潮; 30.851111, 121.848528). Other goodies were Lesser Coucal catching a frog, Asian Stubtail joining Fairy Pitta at the photography setup, and season’s first Yellow-browed Warbler, Siberian Thrush, and Blue-and-white Flycatcher. 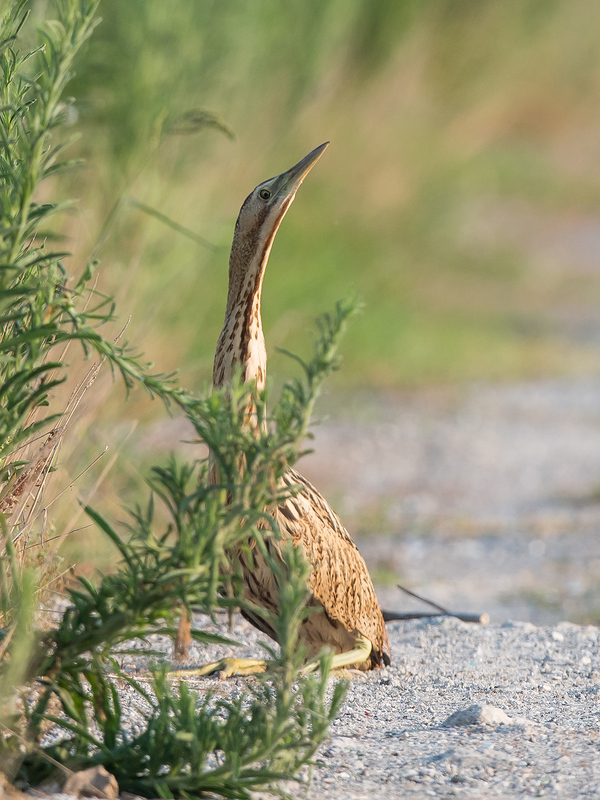 We had Green Sandpiper, Grey-tailed Tattler, and a migrating flock of Red Turtle Dove near the Pechoras and Eurasian Wryneck in the recently planted trees on the inner base of the sea wall. 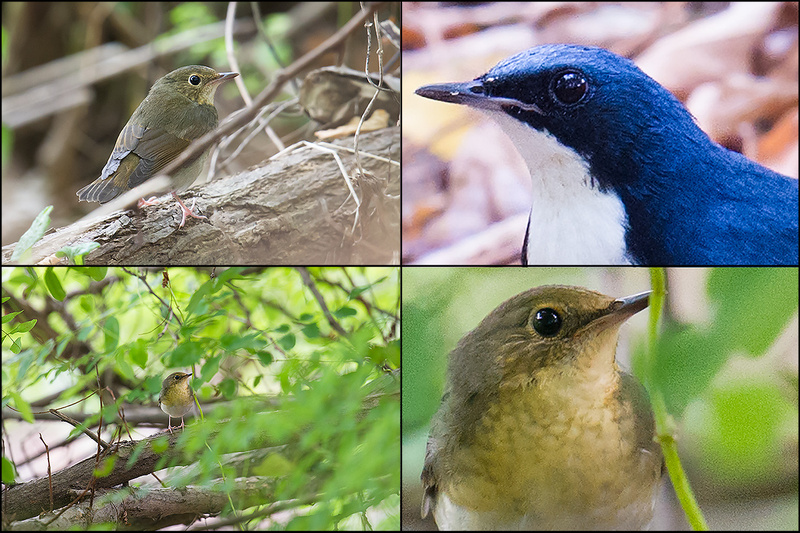 The microforests yielded a second Fairy Pitta, 8 Black-naped Oriole, 7 Japanese Paradise Flycatcher, and a good count of 12 Siberian Blue Robin. Our trip to the sod farm was cut short by rain. Before the shower we noted ca. 800 Oriental Pratincole. Obviously this grassy area is important to the species, which breeds in the Shanghai region and which with the development of Pudong has seen a dramatic shrinkage of its territory. On Mon. 5 Sept. Elaine and I did our first urban birding of the season at Shanghai’s Century Park. Among the 24 species we noted were passage migrants Oriental Dollarbird, Asian Brown Flycatcher, and Grey-streaked Flycatcher.